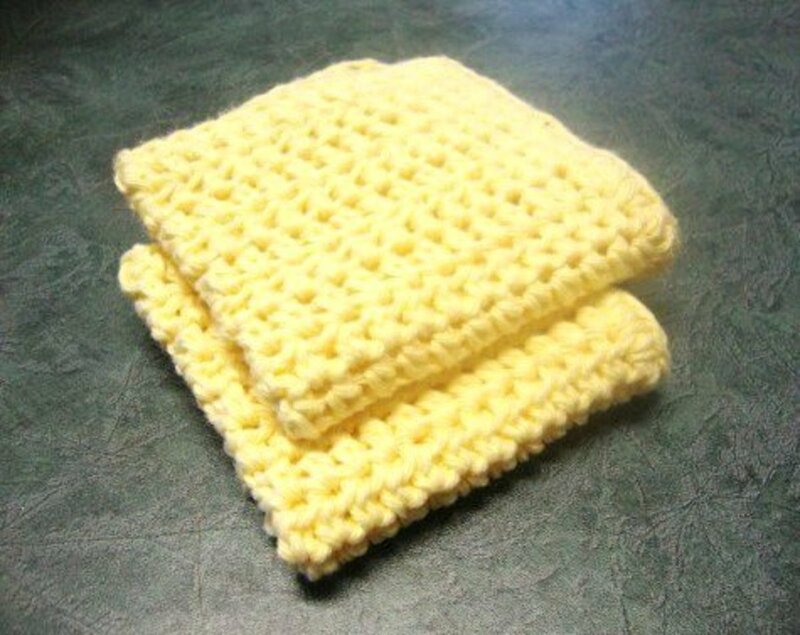 Whether you choose to knit or crochet them, homemade dishcloths do a great job of clean-up in kitchen areas. Because of the type of cotton used, they are very absorbent and stand up well to wear. Once someone has used either, they often choose to never go back to store-bought cloths. They find a difference in absorbency from store the-bought cloths and prefer the homemade variety. 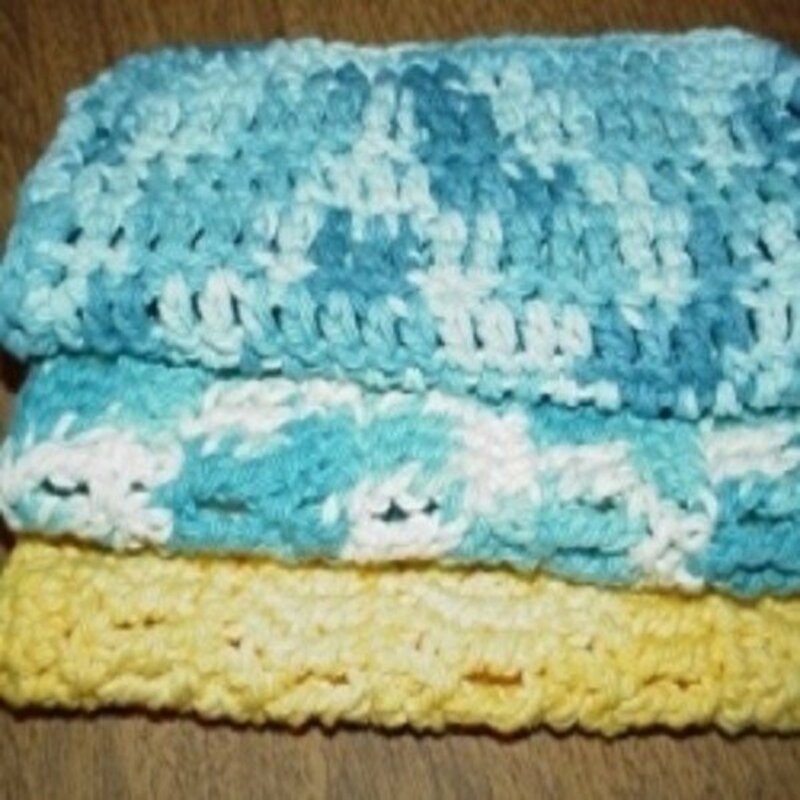 Homemade dishcloths are made either through knitting or crocheting. It might take slightly longer to produce knitted dishcloths, while crocheting them may be faster. Either method produces dishcloths suited for the task, with slightly different-textured fabric. Much depends on someone's preference and what crafting method they choose to produce cloths. While either method is suitable, generally speaking, a knitted cloth will take longer to make. It will be smoother and somewhat softer, and you will use less cotton in making it, while a crocheted dishcloth will be slightly stiffer (good for scrubbing) and will use up a bit more cotton in its construction. Either method will be up to the task. For those who don't know how to knit but who prefer homemade dishcloths, crocheting offers a workable alternative. 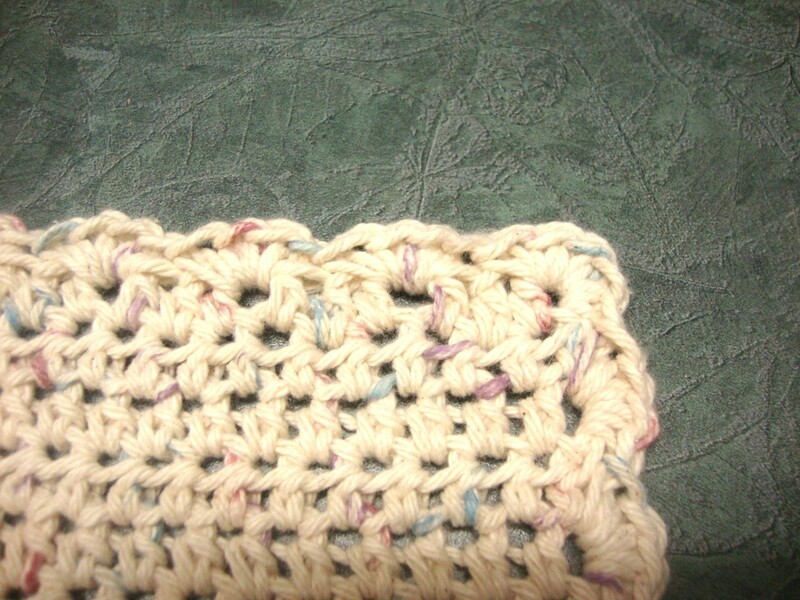 This article details how to make a crocheted dishcloth with scalloped edging. The dishcloth seen here has a looser feel to the fabric. It does a good job of scrubbing and cleaning because the hdc adds a bit of bulk by dent of the type of stitch it is. 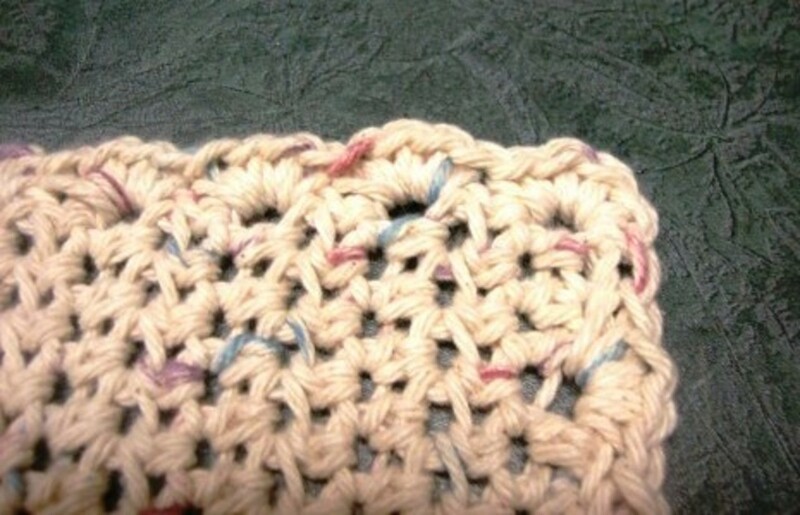 If you want denser cloths, work your crocheted dishcloths with a smaller hook and use sc instead of hdc. 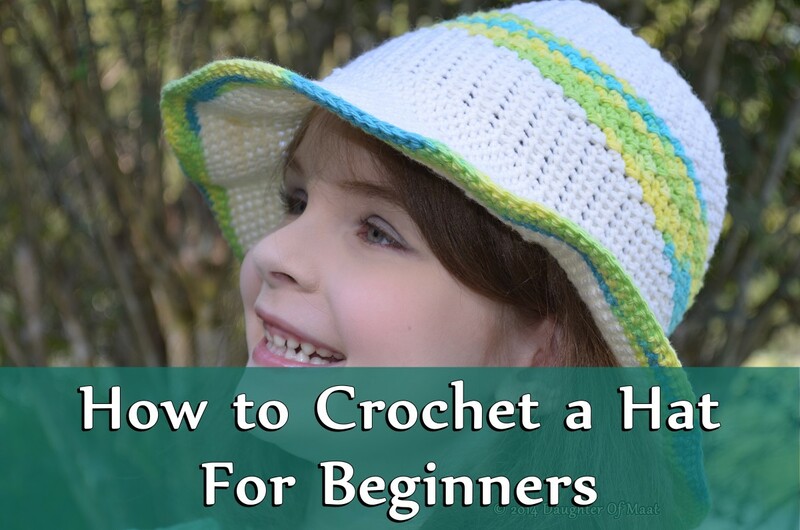 If you've come to this page and have never made your own dishcloths, rest assured that crocheting them is relatively easy. 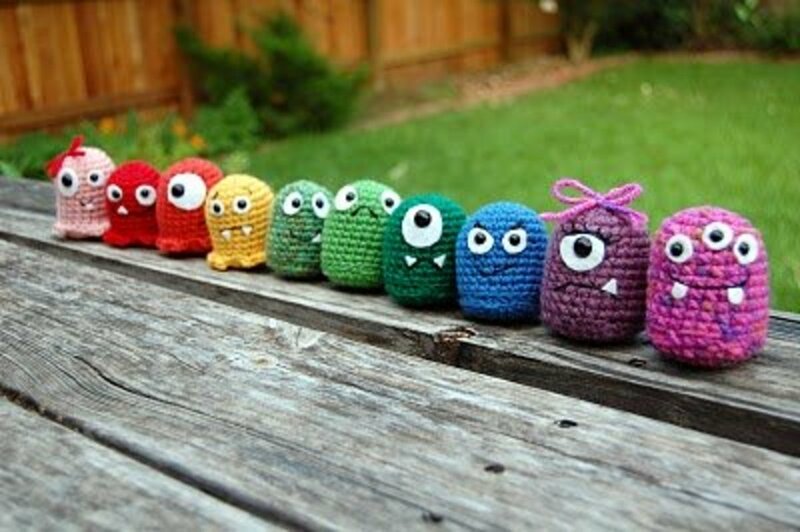 They can be created in record time, using just a few simple crochet stitches. Because crocheted dishcloths do not take much cotton yarn, this is a great way to use up scraps of left-over crochet cotton. If you have never made anything with cotton and are planning on making a stack of dishcloths, you might opt to purchase a large skein of kitchen cotton before you start. It is essential to use Kitchen Cotton or Handicrafter Cotton. 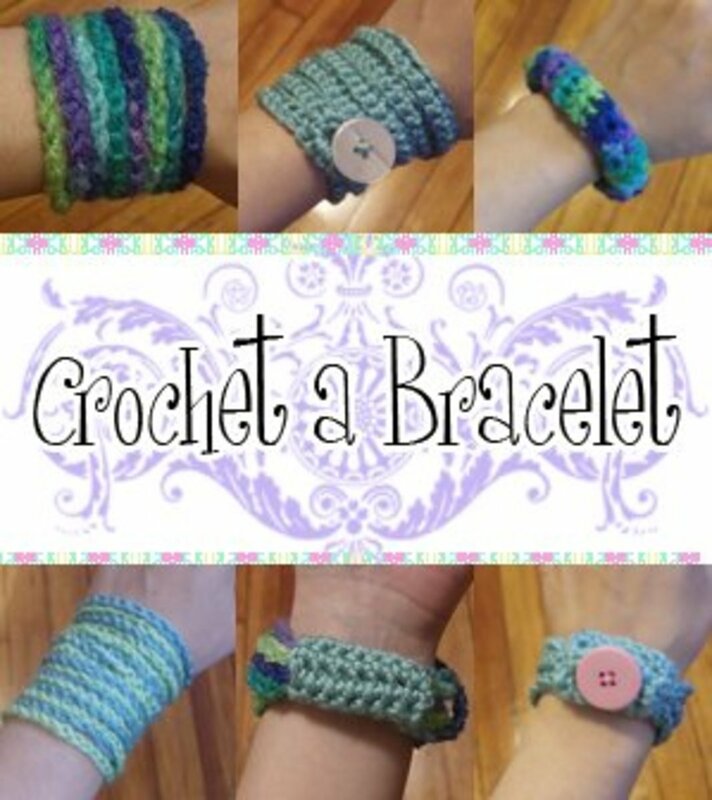 What is the Right Yarn for Making Crocheted Dishcloths? Cotton is different from acrylic yarn, it's tough and, more importantly, highly absorbent. When you wipe it across a counter or a dish, it doesn't just slide off the surface, smearing any water. Instead, it holds to the surface and thus creates a bit of friction, which is perfect for cleaning. Surprisingly, texture does play a roll in cleaning and a fabric that is slippery and non-absorbent just doesn't make the grade. Do not use regular yarn! Acrylic yarn is not absorbent and will merely smear water across your counters. Because of its smooth texture when wet, it does a poor job of counter clean-up and washing dishes. You truly cannot substitute, so make sure you use the right material for the job. 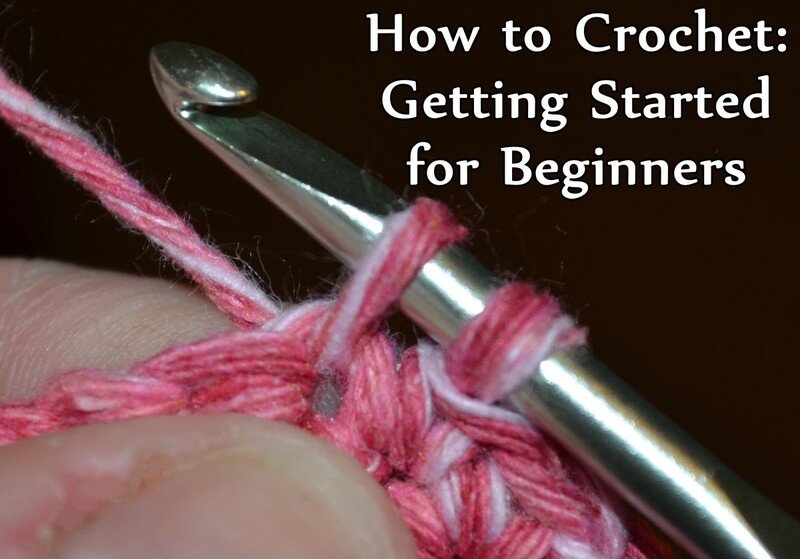 Many crafters have related that when they first got started with crocheting, they tried to make dishcloths using regular yarn, and found to their chagrin and disappointment that something was very wrong. They weren't sure what they had done wrong but the dishcloths were all but useless. Kitchen cotton is less fuzzy and resembles a thick thread. Usually skeins of kitchen cotton will have pictures of dishcloths on the label, which helps when looking for it in the craft section. If uncertain, ask a salesperson who can guide you to the right section. These pretty-looking dishcloths can be made in about one hour. For the dishcloth pictured in this article, a variegated cotton has been used in a neutral shade. Row 1: Ch 22 + 2 ch (forms first hdc). Row 2: Hdc in third chain from hook. Continue working hdc stitches in each chain loop until end of row. (23 stitches) Ch 2 and turn. Rows 3-17: Start each row by working first hdc in stitch next to ch 2 which makes first stitch. 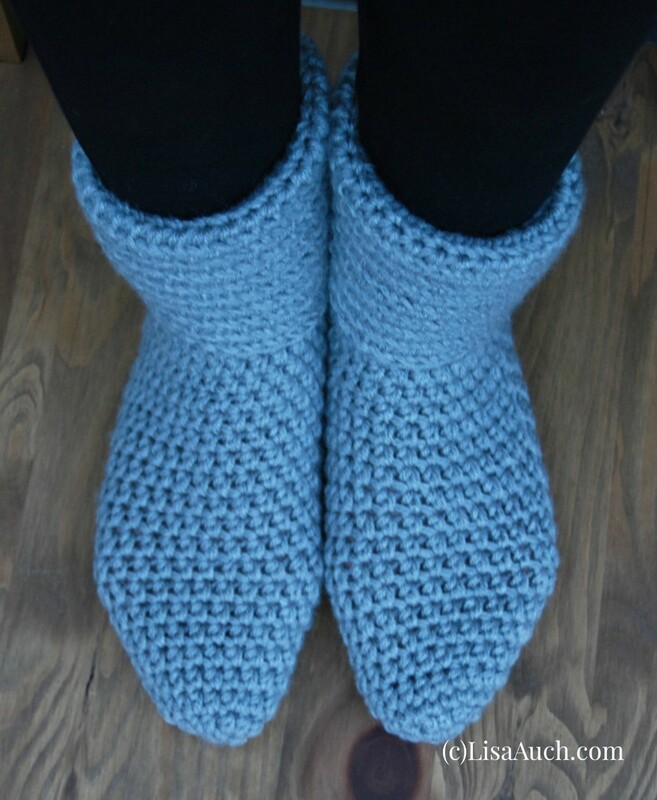 Work each successive row by working hdc in each stitch underneath. Ch 2 at ends, then turn dishcloth before working successive rows. 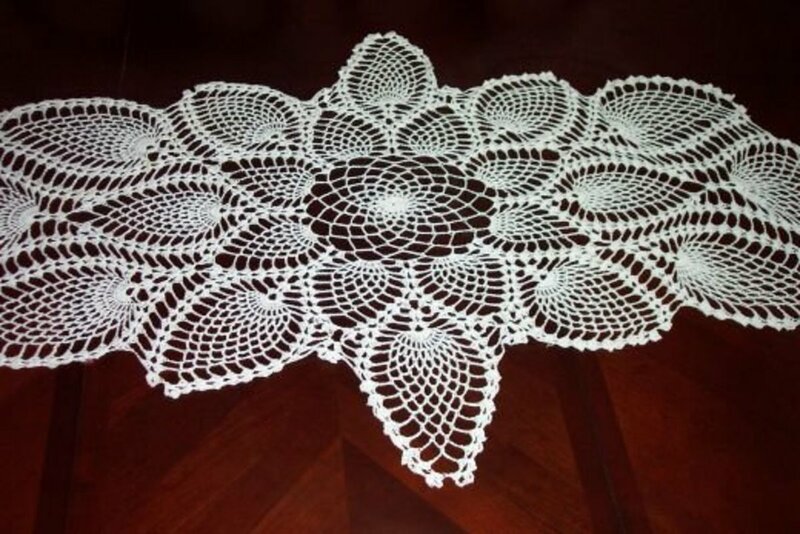 As can be seen, this is an easy dishcloth to crochet. It is a good idea to create either a dense or slightly bulky fabric for dishcloths, as this serves better for cleaning. Knit fabric is ideal for creating a dense fabric because of its smooth texture and close stitches but for those who do not know how to knit, if a dense type of texture is desired, work with a smaller crochet hook to make your fabric tighter. If you need to refresh your memory on how to work hdc, please see the video below. Never throw out your Kitchen cotton scraps because these are perfect for adding edging around your dishcloths. Using a different color for the edging can add definition and helps to finish your cloth. Near end of last row, do not work hdc in last stitch; instead, crochet 5 sc in corner loop, then continue along side, working 4 sc in every other rib (see photo), leaving a space (rib) between scallops. Work in these same openings when reaching the opposite side of cloth. When edging has been worked all the way around dishcloth, finish by skipping two spaces and joining with a ss. This is an easy-to-execute pattern using hdc stitches to make a textured square crocheted dishcloth and sc stitches to finish it with a pretty-looking scalloped edging. The texture serves well for scrubbing, while the edging adds eye-appeal. If you aren't overly concerned about your scallops being "perfect," you can also just work 4 sc along edges, visually spacing them out. While you can use your crochet hook to pull your tail or end along the backside of your cloth, I do not recommend this because the tail will work its way loose later. If you have a large-eyed needle, it is better to sew your end in and thus prevent unraveling later. 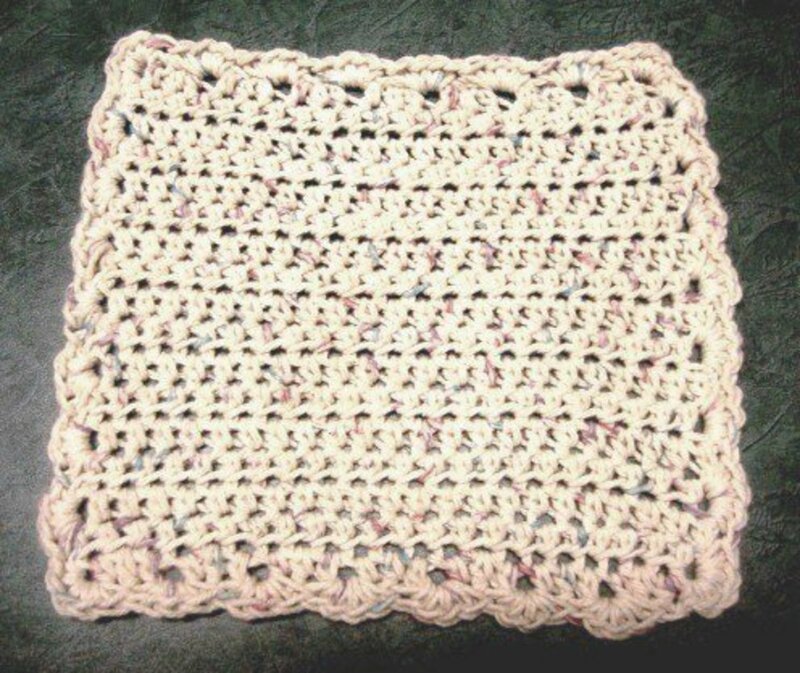 Have You Ever Made a Crocheted Dishcloth? After Reading This Article, I Will! As touched on in this article an edging can help to finish the look of your dishcloth. Scallops can also be worked in a different color if you want greater definition. Variegated cotton lends a very pretty look. 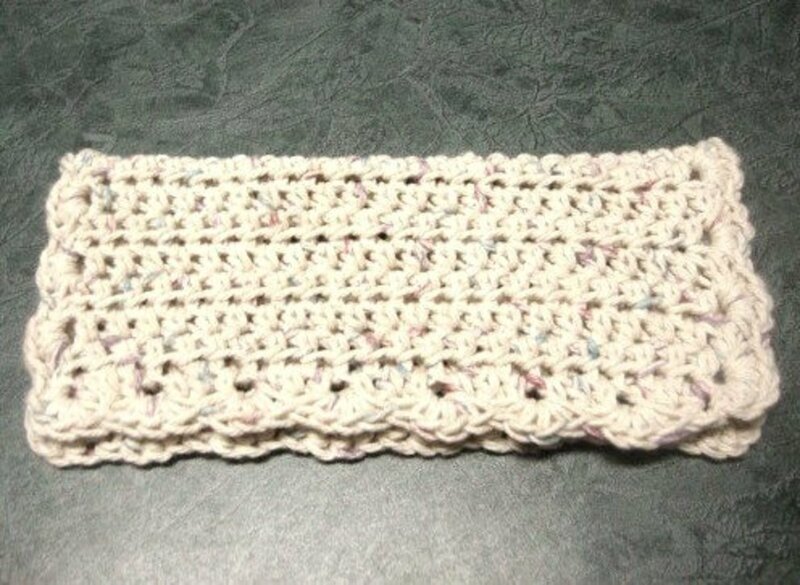 If you just want a good basic dishcloth and do not wish to create a fancy edging, please see my article, How to Make a Crocheted Dishcloth--Easy Pattern Using Half Double Crochet for a plain-Jane dishcloth you can make with no fuss and no muss. I know a number of people who only use crocheted dishcloths. I'm also a big fan of crocheted pot holders. They hold up like nothing else! Thanks for another great tutorial. I love the job they do of cleaning. Another lovely pattern. They actually make really nice gifts, especially when presented in a bale. Hi wonder, I have a pattern for a plain dishcloth that I included in the links section. These are more serviceable and might be easier to use. Hi Wonder, they do a great job of cleaning but you have to use the kitchen cotton and not yarn. Yarn does not have the absorbency that kitchen cotton does. This is pretty and looks simple. I would love to make dishcloths but then it makes me wonder would I really use them to clean dishes and kitchen counters! I am planning to use this pattern as a scarf! Will surely upload if I make one :) Thanks for sharing!